HomeHealthMost PopularBreathtaking New MRI Scan Of Unborn Babies In The Womb Show Smiling, Wiggling And Kicking! Breathtaking New MRI Scan Of Unborn Babies In The Womb Show Smiling, Wiggling And Kicking! This incredible video is the next level of baby bump scans – using hi-tech MRI so detailed it reaches right through the unborn tot’s body. The astonishing video is one of the first in the world to use algorithms, magnetic fields and radio waves to create extra-high quality images of a tiny foetus. It is so detailed you can clearly see the tot – around 20 weeks old – fiddling with its umbilical cord, stretching its arms in the womb and turning its head from side to side. And despite its heart being smaller than a PENNY, it can been seen beating in the scan which is so clear you can even see the baby swallowing. The 24-second video scan ends with the cheeky little one giving its mum an enormous kick with both legs, causing her belly to wobble. Unlike ultrasounds, the high tech scan shows beneath the baby’s skin and beats normal MRI scanners by using complex technology to get usable images from even the wriggliest babies. It was captured by the iFIND project, a London-based group of medical experts from around the world who made the world-first tech in a bid to improve ante-natal scans for all mums-to-be. 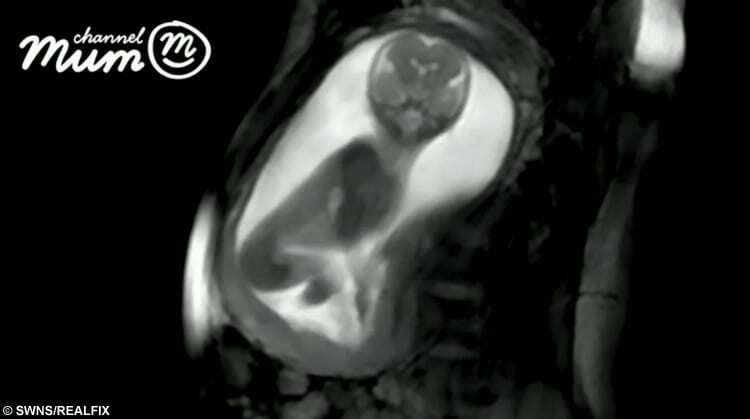 This baby shows he’s belly happy – after giving his mum an enormous kick in the most life-like scan image ever. Dr David Lloyd, Clinical Research Fellow at King’s College London and part of the iFIND project, said: “Taking pictures of a 20 week fetus while they’re still in the womb really isn’t that easy. “For one thing, they’re very small. “The fetal heart, for example, with all of its tiny chambers and valves, is only about 15mm long: less than the size of penny. “Ultrasound technology – used in all routine antenatal scans in the UK – is actually fairly good at visualising these tiny structures. “It uses very high frequency sound waves which are reflected back (“echo”) from the structures inside the body to produce an image. “In fetal ultrasound, the images produced can be excellent; but unfortunately that’s not true for every patient. “Ultrasound has to be able to “see” through the body to the parts of the baby we want to image, and that isn’t always easy. “It will depend on the age of the baby, how they are lying in the womb, the size of the mother, and many other factors. “MRI, which uses a strong magnetic field and radio waves to produce images, isn’t so limited. “It can see the structures inside the body regardless of whether there’s bone, muscle or fat in the way; and in some cases it can give us even more detailed images than ultrasound. The team behind the new scan were given £10 million by the Wellcome Trust and the Engineering and Physical Sciences Research Council (EPSRC) to develop new scans. It is the most cutting-edge scan available to date and is possible due to an algorithm developed by the team. It automatically copes or ‘corrects’ small fetal movements made by the baby during the scan to create clear images. Normally if a baby moved rapidly in a conventional scan – just like the baby here – you would get an unusable image and the mum might have to return for a re-scan. Medics hope to develop the technology so it will eventually involve four probes which automatically move around the top of the mum’s tummy to get the best image. It would mean more complications could be picked up earlier and even treated before the baby is even born. The images, taken during a trial, were of an anonymous mum at a hospital in London. They were given to video parenting site ChannelMum.com to share with pregnant mums around the world. Cathy Ranson, editor of ChannelMum.com said: “Scans are amazing as they help mums, dads and even other family members bond with their baby. “There is nothing quite as emotional as seeing your unborn child moving inside you, and these MRI scans are taking images to the next level. The team behind the new scan technology are from Kings College London, St Thomas’ Hospital, Imperial College London, University of Firenze, the Hospital for Sick Children in Toronto and Philips Healthcare.